What is the Disposable Employee Model? After Peet’s Coffee & Tea in Chicago fired a dedicated employee of 5-year tenure, and threatened to fire another, baffled Peet’s customers came to us asking, what is going on? Why is Peet’s getting rid of our favorite baristas? We realized that it was time to explain in detail a system that has long been obvious to those on the inside. It’s called the Disposable Employee Model. The D.E.M. is a strategic combination of policies that guarantees short-term employment among the bottom 80-90% of a company. What companies use it? More each year, in particular: fast food companies, grocery stores, big box retailers, chain restaurants, and fast coffee. What does the D.E.M. look like for a Peet’s Coffee & Tea employee? Mixtures of shifts that start as early as 4:45 a.m. and end as late as 10:00 p.m. Defining a job as part-time implies that it is “transitional”: Employees aren’t invested enough to protest, because they are constantly looking for a new job, which often comes in the form of a lateral move to a company with similar work conditions. Defining a job as part-time implies that it is not a “Real Job”: Employees do not hold the job to “Real Job” legal standards, accepting injuries, sexual harassment, discrimination, and intimidation as simply par for the course. No full-time option means an employee must get a 2nd job to survive: Employees are too exhausted juggling 2-3 jobs to come together to try to influence company policy. Defining a job as part-time implies that it is “unskilled labor”: Working in a society that values investment over labor, employees internalize rhetoric that demeans the value of their contribution to the company and shames them into silence about the abusiveness of their work conditions. Harsh but selectively enforced rules keep employees in constant fear of losing their jobs: Employees know that raising any real questions with management about the dysfunction of the system is likely to make them targets for retaliation. What do Peet’s workers have to say? If you learned something from reading this post, please share it on social media! Short link: bit.ly/dempost, hash tag: #notdisposable. 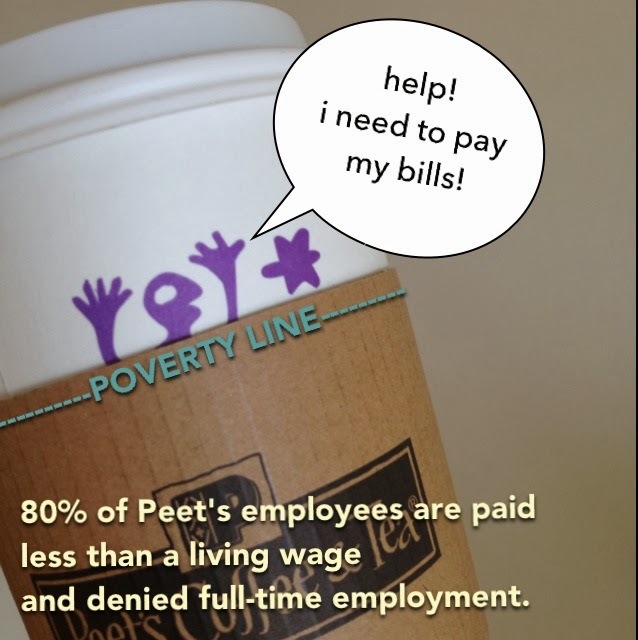 Through dialogue, education, and action, the Peet’s Workers Group (blog Facebook) strives to create just and sustainable employment for 100% of Peet’s employees, and to establish a permanent voice for Peet’s retail workers. Peet’s Coffee & Tea is a specialty coffee roaster and retailer with more than 190 stores.